Yes, I still have Cosmoprof polishes to share with you. 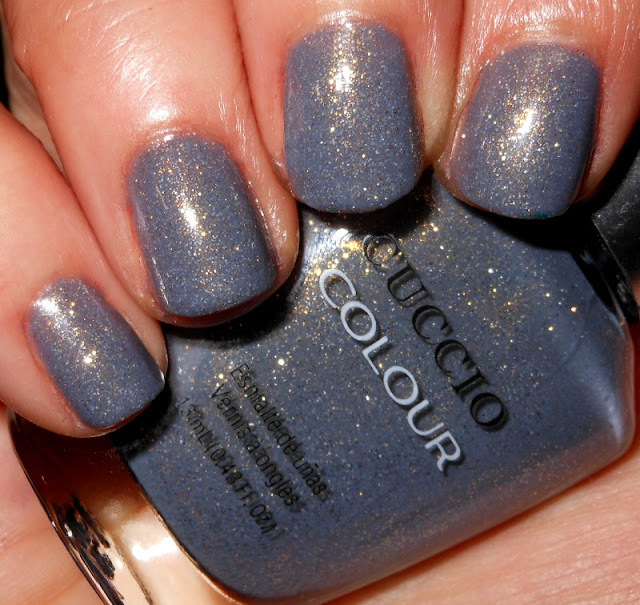 This one is from the brand Cuccio which is a brand exclusively used in salons, but you can find some online. This color is from their current winter NUDEtrals collection. After the holidays I am over colorful and loud nail polish, at least for a little while. The first weeks of January I stick to neutrals or soft tones. The first of the year is the perfect time for palette cleansing polishes before we break out the colors of spring. My jaw dropped when I saw this color at Cosmoprof. I thought it was one of the most beautiful colors I've seen with a gorgeous finish. 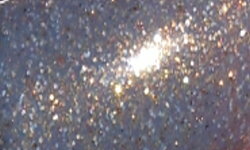 Grey's Anatomy is a soft gray-blue packed with gold and bronze microglitter. Color: Ive mentioned on this blog before how much I love cool-toned colors paired with warm metals. This is stunning combination of a dusty gray-blue with that intense fiery gold and bronze glitter. It's a color combination I wish I saw more of in nail polish because it is so beautiful. I love this muted shade with that teeny bit of glitz. Formula: The formula on this was OK. I so wish this formula was spectacular because this would be an all star polish in my book. The base of is it a bit sheer and thick. I wish the base had a creamier consistency rather than a sheer almost gel-like one. It's not terrible, but it's not good and not what I'd expect from a salon brand. I used 3 coats. Price: This is around $8 if you look around for it online. Overall: I am head over heels in love with the color of Grey's Anatomy. The beautiful soft gray-blue base and that glitter makes a gorgeous polish color. The formula leaves a lot to be desired though which is very disappointing considering how much I love the color itself.